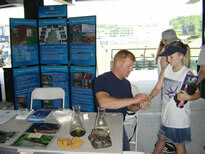 The Altoona Water Authority participates in the Blair County Ballpark’s Curve Kids’ Days. A table is set up in the main concourse where representatives from the AWA are available to answer questions and provide information to the kids in attendance. They have a chance to learn about the water cycle, collect pens, rulers, cups and make a bracelet using different colored beads to represent the steps of the water cycle.